How can you obtain the real-world experiences Dan Heffner is referring to? The Ithaca College Los Angeles Program is a great place to start. As an extension of the Park School, the program provides 75 students each semester with internship-based experiences in a variety of fields including film and television production, radio, music, advertising, public relations, and print and broadcast journalism. 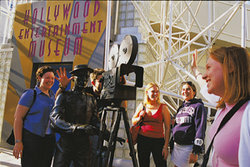 Students also take industry-related courses taught by our Los Angeles-based faculty and industry professionals for credit at the James B. Pendleton Center, just minutes away from Burbank and Hollywood. Dan Heffner is best known for his work as the producer of the Saw horror film franchise. Make Your Own Cult Classic! Saw producer Dan Heffner '78 screens his new film at IC: It’s 4:30 p.m. on a gorgeous Friday afternoon, yet the auditorium in the Park School of Communications is packed with students, some of whom have been waiting anxiously in their seats for over three hours. Why? Because Dan Heffner ’78, best known for his work as the producer of the Saw horror film franchise, has returned to campus to host a special sneak preview screening of his latest film, Repo! 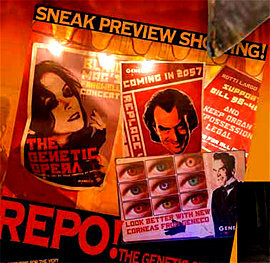 The Genetic Opera, a rock opera horror that Heffner describes as Rocky Horror Picture Show meets Blade Runner, with an eclectic cast ranging from Sarah Brightman to Paris Hilton. This screening is a direct result of a previous visit to campus to talk about his career and the Saw franchise. During that event Heffner showed a small clip of Repo, sparking interest in his new film. “Everybody was excited, and as the night wore on I started getting more questions about Repo,” he says. The students urged him to bring the film, which is a limited theatrical release, to IC. Heffner decided to take it one step further by bringing the film to Ithaca as a sneak preview screening -- one of the first in the country -- before its official release. Screenings like this are not the only thing Heffner does for IC students. Next spring, for the third year in a row, he will sponsor a postproduction seminar for a group of select students chosen by the Park School faculty. Heffner pays for the students to stay in Toronto for a two-day whirlwind look at Saw's postproduction process. Heffner talks to students during his most recent visit to Ithaca. This sounds really really cool!